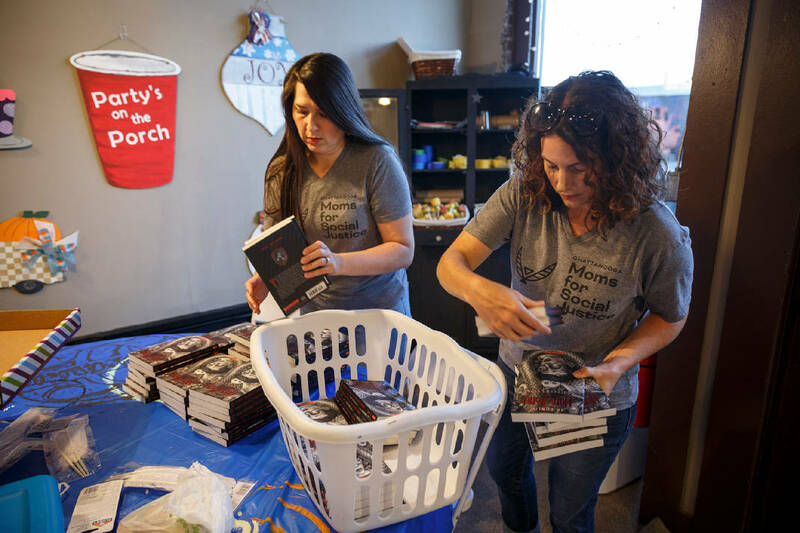 Taylor Lyons, right, and Stefanie Dalton unpack copies of Harry Potter and the Sorcerer's Stone at The Crafty Social during preparations for Chattanooga Moms for Social Justice's Harry Potter-themed Magic of Literacy event on Thursday, Oct. 4, 2018, in Chattanooga, Tenn. The group is announcing an initiative dubbed the Classroom Library Project which will fundraise to donate full libraries to Hamilton County teachers. Taylor Lyons couldn't wait until her son, Raine, started reading the Harry Potter book series by author J.K. Rowling. Mari Smith's parents encouraged her to read when she was growing up, and the same books were some of her favorites. Stefanie Dalton grew up in a military family — she says Harry Potter was the only thing that got her through dozens of moves. The Magic of Literacy event is from 4 to 7 p.m. on Oct. 21 at the Chattanooga Choo Choo at 1400 Market St. The event is free, family friendly and open to the public. Raffle tickets will be on sale for $5 a ticket. For more information, visit www.facebook.com/momsforsocialjustice. "Books were my escape. They were my best friend," she said. These three women, leaders of the local activist group Chattanooga Moms for Social Justice, want to share the magic of Harry Potter — and reading, in general — with the children of Hamilton County. To do this, they want to help provide teachers with their own, individual classroom libraries. The moms, who have been behind other notable activism in Chattanooga such as supporting student walkouts and demanding gun control reform, are hosting a Harry Potter-themed event, The Magic of Literacy, on Oct. 21. There they will announce their next big initiative — the Classroom Library Project. School libraries across Hamilton County Schools system vary. Some have dozens of new, popular titles and others have dwindling, out-dated selections. Though the district recently invested in literature for some Opportunity Zone schools, many classroom teachers still lack options in their classrooms that their students want to read. "We did quite a bit of work this summer in Opportunity Zone schools, mainly Brainerd," Lyons said. "We were struck by the fact that not only was the volume [of books] so low, but the books themselves were widely outdated. It was just shameful and, quite frankly, shocking." Experts agree that one of the best ways to encourage students to become readers — something Hamilton County struggle with since only about 34 percent of third through fifth graders can read on grade level — is to make well-stocked libraries available to them. A variety of genres, replenished, updated stock, high-quality texts, an inviting, attractive atmosphere and time to read are essential for children to engage in reading, according to a Scholastic report, The Importance of the Classroom Library. Lyons said the group decided to find individual teachers and raise money to provide a selection of books and create a library for them and their students. "From our perspective, what is more important than putting books in the hands of the neediest students in Hamilton County?" Lyons said. As the idea for the Classroom Library project took shape, the group decided the best way to promote the initiative was through a free, community event — and what a wonderful excuse to throw a Harry Potter-themed event, the moms joke. "Other moms in the area, especially suburban moms, don't know what it looks like in these higher-needs schools," Smith said. But through this project, and gathering books, shelves, bean bags and other materials and installing the libraries themselves, she hopes they will come together to support these schools. "That's something we have — we have a community [that] wants to make change in the community." The group already has the first library for Katelyn Dix, a ninth grade teacher at The Howard School, funded by the campaign of Danielle Mitchell, a candidate running for the 3rd Tennessee Congressional district seat. The group estimates each library will cost about $1,000 to $1,500. The Magic of Literacy event at the Chattanooga Choo Choo on Oct. 21 is meant to raise awareness about the group's goals and raise money for the project. The group says the event itself is going to be magical. Albus Dumbledore, Severus Snape, Minerva McGonagall, Sybill Trelawney, Nymphadora Tonks and even Harry, Ron and Hermione will be there, as members of Chattanooga's cosplay community and other actors and entertainers have united to bring many Harry Potter characters to life for the event. Magical creatures from the Chattanooga Zoo, themed treats including butter beer and chocolate frogs, a sorting hat and family and kid-friendly activities also will be there. The group has been planning and crafting for months — even creating its very own clay mandrakes, functional turnip-like creatures in the novels, for the event. Raffle tickets for a variety of prizes including Harry Potter-themed LEGO sets, stays at the Chattanooga Choo Choo hotel, and more will be sold at the event. Photo opportunities with the costumed characters will be available as well as the chance to be sorted into one of the four houses of Hogwarts, the fictional school of magic that Harry Potter attended in the books. But most of all, the event is meant to bring people together to celebrate reading, Lyons said. "We are hoping eventually that our [Moms for Social Justice] community and partners can develop a partnership with a library," she said. For more information, visit www.facebook.com/momsforsocialjustice.